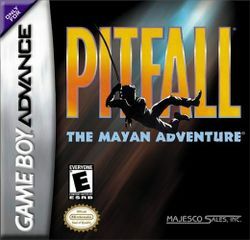 Pitfall: The Mayan Adventure is a video game released in 1994 for the SNES and Sega CD by Activision. It was ported to the Sega Genesis (1995), Sega 32X (1995), the Atari Jaguar (1995), Windows (1995), and the Game Boy Advance (2001), with the last one published by Majesco. It was also the first commercial game released for Windows. An extra feature in all versions is the ability to play the Atari 2600 version of Pitfall! after finding a secret doorway. The doorway can be found by looking for something that seems out of place. The Mega-CD, 32X and Windows ports contained extra (and expanded) levels and other enhancements over the earlier versions. The Windows port was based on the Mega-CD version, and made using Kinesoft's Exodus game technology, which was later used to make the Windows port of Earthworm Jim: Special Edition. In this game, the player takes the role of Pitfall Harry Jr., son of the hero of the original game, who has to find his kidnapped father. This page was last edited on 30 May 2016, at 13:37.